I have to make a confession. It’s not an easy confession to make since I’ve been a card carrying sci-fi geek all my life, but it’s best you all know the truth. 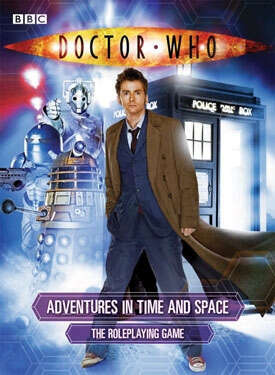 The truth is this: I know next to nothing about the Doctor Who Series. Cubicle 7 games have decided to introduce me (and many others) to the good Doctor in a big way. Although I’m reviewing a full-color PDF of the game (thanks to Cubicle 7 for my reviewer’s copy), they have created a RPG rarity in this day and age–the RPG box set. Yep, for $59.99 game lovers will get three books–players, game masters, and adventures, a handful of blank and filled-out character sheets, and other bits of goodness. All of these are also in full color and look quite smart. Let’s talk about that smart look right now. The book is laid out in full-color glory. Beautifully bordered by graphics that include the TARDIS, the two-column layout is impressive. Sidebars are off-set in blue and work to keep (a) information separated properly and (b) important information in a good place. For example, the core make-up of characters–attributes, skills, and traits–earn one of the first sidebars. The character sheets look good, but are eerily similar to Eden’s character sheets for Buffy, Ghost of Albion, and Army of Darkness (more on this later). The graphic design and layout team did a stand-out job on this project from the books to the gizmo sheets. About the only thing that isn’t really attractive (or needed) are the Story Points sheet. Sheets like these aren’t really important because I find most groups tend to use chips, coins, or a myriad of other tokens. Printing out oodles of heavily colored paper probably won’t appeal to most groups. Artwork isn’t really a point to these books as they are generously laced with photos from the show. I think the game master’s book has the best mix of pictures from the show, but all the books compete. Let us move from the non-issue of artwork and get into the meat of 200 plus pages of time-traveling goodness (‘course I won’t go into the adventure book because I never go into the adventure books). There is a four-page quickstart guide, which is handy for giving to all the players at the table. The player’s guide proves to be a great starting off point for the game. It’s here we find four chapters–an introduction, character creation, basic rules, and a short tidbit on player advice. Going well beyond or beneath a Difficulty has special effects that include increases or decreases in damage (among other things). Fans of Eden’s Unisystem will see a very similar mechanic to their Attribute + Skills + 1D10 = Result (of which is compared to the Difficulty. Going higher is better and earns extra benefits). I admit there are a limited number of ways to create a randomizing element to a game. Handfuls of Dice are used in White Wolf’s games and FASA’s old Shadowrun line (not sure that Catalyst Labs use the same system). Various game lines run off percentiles. This game, for me, just used too many of the same elements from Cinematic Unisystem. They have the same mechanic, although the dice are switched. They have Story Points that look (and do) much of what Drama Points did for Cinematic Unisystem. Qualities, which are a common element to many games, don’t always have character types as Qualities. For example, a Slayer is a Quality in Buffy the Vampire Slayer and a Time Lord is a Quality in Dr. Who. Lots of similarities exist between these games. One distinction is how Eden’s game use a scale (starting with nine) that raises to the next level after every other number. Rolling high is still keen, but is different in this game. In Dr. Who, the Game Master will set a Difficulty, which will be met, exceeded, or missed; furthermore, missing or making it by nine creates botches or exceptional successes. This does permit a bit of different game play. Combat in the game does something I really like. After taking damage, Attributes are affected. There are no health points. Damage comes right from the Attributes. This isn’t a game centered around violence; these mechanics ensures players will seek out alternate means of dealing with antagonists (unless they like making new characters). The last bit (about eight pages) to the Player’s Guide focuses on what it means to be a player. These are good tips for new players and fine refreshers. The writing holds well for this part of the book and says just enough to make a solid point. Let’s switch to the Game Master’s book now, which is a bit larger (143 pages to the 90 pages in the Player’s Guide). The first two chapters (and nearly 75 pages) are almost identical to the Player’s Guide. You have character creation and an explanation of the rules. My first impulse was to wonder why one would repeat two entire chapters in a boxed set of books. The quick answer is that they didn’t. Each book’s writing is geared for individual audiences. There are hints in the game master’s book that don’t exist in the Player’s book. It permits different ways of looking at the same material, which I think is pretty enlightening for gaming groups where a player may be ready to start running games. Chapter Four deals with time travel. This can of worms is often tried out by RPGs. Since Dr. Who has been exploring time travel for decades and has it thought out good enough for me. There is a place of paradox. Most time travelers will become quickly frustrated by the machinations of other time travelers (frustrated in-game rather than at some game mechanics. Good frustration). This chapter also explains the workings of the TARDIS. The authors devote about ten pages to this device, which I think proves sufficient to fans of the show while not swamping newbies like me. Bring on the Monsters! Chapter Five does just that, although I should say aliens instead. The chapter brings a healthy dose of alien life to the game, complete with satisfying write-ups, photos, and stats. The chapter wraps up with “so you wanna be an alien” and the character creation rules for doing such a thing. I suppose these rules aren’t in the player’s book because aliens should be a rarity in the group, but your guess is as good as mine. By putting these rules in the game master’s book, it grants control over these characters. Besides, the game master will probably be creating aliens more often than the players. Chapter Six lays out what a game master should do in a RPG. Again, this is familiar territory for most gamers; nevertheless, new gamers should find this material useful. One thing of interest is a bibliography of key Dr. Who materials that can help a GM unfamiliar with the setting. There is also a technobabble sidebar I found to be funny. Some of the finds in this chapter surprised me, most notably being the listing of “dreaded gamers.” Tactics for the rules-lawyer and the cheat are covered (along with others). While these tactics may not be as inspired as I’ve read in other places, they do have some bite. The final chapter helps game masters learn how to create a story. Again, familiar turf that will be good groundwork for newer players and game masters. The Dr. Who game has a great deal of promise. I thumbed through an opened hard copy at my gaming store and must say it’s a quality made product. Likewise, the PDF looks fantastic.